London is regarded as one of the most vibrant and historic cultural attractions in the world today. With an abundance of museums, galleries, historic and contemporary landmarks, cultural centres, parks and shopping opportunities on offer, it's no wonder that London remains a popular tourist destination. In fact, it is estimated that around 26 million tourists visit London each year, half of which are British. If you've been planning a trip to London, but you're worried about your budget, then this is the article for you. London is a city with much to offer, and is accessible for everyone of all ages, interests, abilities and budgets. As a matter of fact, London actually has many fantastic and free attractions that'll keep you and your family or friends busy for hours – or even days! So let's take a look at how to visit London on a low budget. If you're going to be travelling to tourist attractions and cultural hotspots in London, you will need to get yourself sorted with your travel card. The most economically efficient way to do this, is to purchase a travelcard. One payment will give you access to all zones on the Underground, as well as paying for your bus trips, so in the long run you'll save if you're not having to continuously pay small train or bus fares. Travelcards can be purchased for more than one day at a time – just check the national rail website for more information. The Tate Modern is one of London's most visited attractions – probably in part because admission is absolutely free! 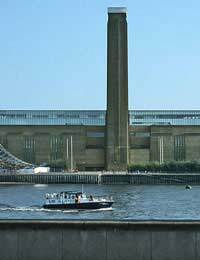 The Tate Modern is a national museum of modern and contemporary art, housing its impressive array of art pieces inside a converted power station on the banks of the Thames. The building itself could be regarded as a piece of art, with the more than impressive open turbine hall stretching for more than 150 metres in length. Work by greats such as Picasso, Pollock, Warhol, Mattise, Dali and Cézanne can be seen at the Tate Modern, with the satisfaction that you haven't spent a penny for the privilege. The Science Museum is home to many awe-inspiring and mind-boggling scientific objects – a great fun and educational free attraction for families. The museum has no less than seven floors of exhibitions and galleries; although, you may have to pay charges to visit some of the exhibitions, simulators and the IMAX 3D cinema. A great aspect about The Science Museum is that there are many interactive activities on display, so children can get stuck in. Kenwood House is set in the beautifully tranquil parklands of Hampstead Heath, and is open to the public free of charge. The house itself is a masterpiece of architecture, but it is also home to some impressive interiors from the likes of Rembrant,Gainsborough, Turner and Reynolds. The house is open daily, and during the summer also hosts a number of live music concerts. Combine history and action with a day out at the RAF museum – again, admission to this museum is absolutely free. The museum is home to over 80 aircraft, and houses a collection of photographs, weapons and uniforms for your perusal. A popular attraction at the RAF museum is the Red Arrows flight simulator, as well as the Battle of Britain sound and light show. If you want to see some British history still in action, take yourself down to Buckingham Palace to witness the Changing of the Guard ceremony. The ceremony takes place on certain days of the year, and is an unashamed display of pomp and ceremony which features two traditionally-dressed guards exchanging duty, set to music. The ceremony takes place at 11am, and you can find out if you'll be lucky enough to witness this event by checking out the Royal website. London isn't just about the buildings, museums and shopping streets – for a packed, diverse city it also has a lot of green spaces that can be enjoyed for free. Hyde Park and Richmond Park are two such areas. Visit on a sunny day with a picnic, enjoy the view, and take some time out from your busy schedule and the hustle and bustle of London.